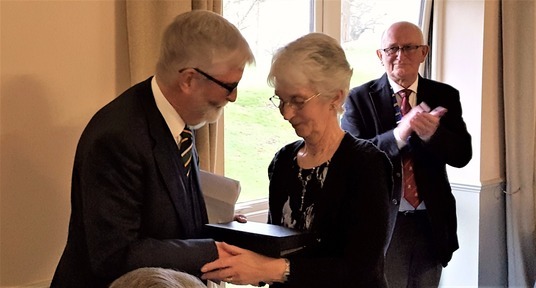 The Presidents’ and Captains’ Committee (PCC) decided in late 2018 to give the 2019 Exceptional Service Award to Anne Harris. 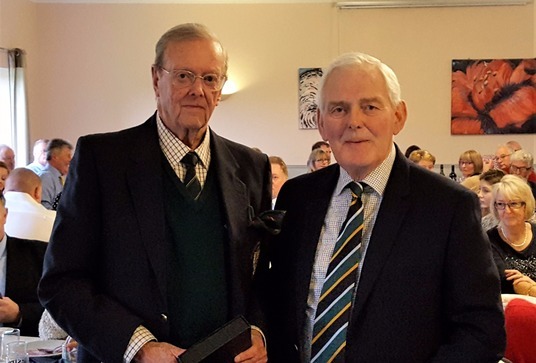 The presentation finally took place at the Past Captains' & Committee Dinner recently with citation read by Past Captain, John Simpson and was then repeated at the Club AGM last Sunday. Anne has been active in Club affairs for over twenty years principally as Ladies’ Captain in 2006 and again in 2016. She has served on the Committee on and off for eight years including 6 years as Chair of the Social Committee and was a Board member in 2014/15. For the Ladies’ Section Anne has captained the “Mail on Sunday” teams, and represented the Club in Shield, Mixed and friendly matches. 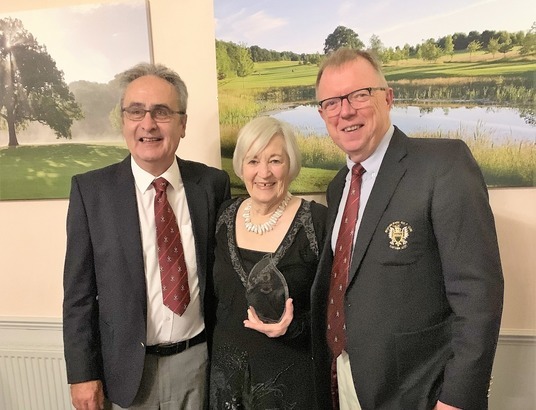 Anne’s contribution to Bedfordshire County Ladies’ Golf was recognised with an award in 2016. Among other things she has acted as our County representative and was Captain of Bedfordshire County Past Captains for three years. Anne has promoted our mixed golf events and organised the monthly Bridge evenings for nine years to encourage members who are playing less golf to stay in touch with old golfing friends. She has organised numerous raffles and other fund raising events in aid of the Club and charities. I am delighted to inform members that an Exceptional Service Award was made to Steve Monico, who has made an invaluable contribution to the Club over many years. Steve, who has been a member since 1993, began what was to be a long and dedicated involvement with the management of the Club when he was elected to be Treasurer at the 2002 AGM. He brought with him great professional accountancy skills and, having spent much of his Christmas 2001 holiday in Tenerife poring over the Club affairs, financial position and cash crisis, he became aware of how much needed to be done. Later that year the General Manager resigned and Vic McDonald, in replacing him, was witness to the considerable task of re-establishing the financial controls and systems that Steve found himself having to tackle as a key member of the Finance and Admin Committee. Steve contributed a huge amount of his time and professional resources to ensuring the Club finances were properly controlled and problems from the past were dealt with. There were significant issues that had led to massive assessments being issued by HM Revenue & Customs for amounts in excess of £2m. Somehow Steve dealt with these, meaning less than £200k finally needed to be paid. This not only required a significant amount of internal finessing to keep members informed and on board with all the changes that needed to happen, but also required Steve to display considerable skill and dexterity in many complex, often lengthy and challenging negotiations with our bankers. Steve brought the Club back into line with the authorities and many suppliers whilst controlling the debt. Steve was also asked to negotiate the termination of Club contracts with two previous professionals and was instrumental in the appointment of the current professional. Steve was closely involved with the creation of the Management Board in 2003 and took over as Chair in 2004 whilst continuing as Treasurer. He passed the Chairmanship on in 2005 and continued as Treasurer until 2008 when he became Club Captain succeeding Eric Murphy. Following his successful Captain’s year did he lay down his burden in 2009? Indeed no: he took on the challenging role of Chair of Biddenham Golf Club Ltd, which is the independent body that is the Club’s landlord. His first responsibility was to present the rights issue to members and shareholders. Its success ensured the future of the Club at Stagsden. 9 years later he still holds that same position. Steve has made an important contribution to the Club for many years and his calm organising ability and unfailing good humour has been greatly appreciated by many members. The strong position of our club in 2018 owes much to many individual members but to no one more than Steve whose steadfast guidance and commitment is deservedly honoured and recognised with this award. Steve Monico, 2018 Exceptional Service Award winner, receiving his award from Vic McDonald. Alvan began golf club membership at Royal Lytham St Anne’s in 1954 and his RAF service took him around the UK and overseas to six other clubs before he retired as a Wing Commander and having been appointed to work at Cranfield University moved to Biddenham from St Neots in 1974 when he joined Bedfordshire Golf Club. He was elected to the Committee in 1978 and Chaired the Social Committee until he was elected as Vice Captain in 1983. Following his Captain’s year in 1984 he continued to serve the Club as Greens Chairman from 1985-88. He was Chair of the Development Committee from 1996-98 which initiated the complex process of organising the move from Biddenham to Stagsden. 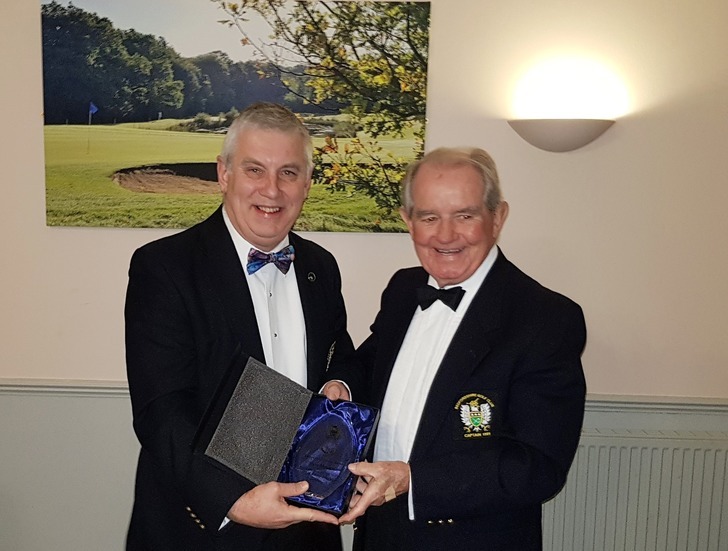 He began his long involvement with County Golf as the Club representative from 2002 until 2009, joining Bedfordshire County Executive Committee in 2002 and served as County President 2004-2005. Following this he was elected to the South Eastern Counties Executive Committee where he served until 2010. He also Captained the Bedfordshire Captains’ Golf Society in 1996 and still serves on their executive committee and best of all is still playing in their events. After 42 years of membership, Alvan with wife Daphne, continues to support Club events and plays regularly with the Seniors. Trevor joined Bedfordshire Golf Club in 1972. He had a unique golf swing the result of a childhood accident. At age 11 he had broken his arm badly and it was forever after crooked. He had been told at that time that he could not now expect to play any sport. But typically he found his own path and as a golfer became very competent and competitive. Many members will have discovered that he was also a very knowledgeable golfer, understanding golfing etiquette, the complexities of the rule-book and the current handicapping system better than anyone. But above all he was great fun to play golf with. He had a mischievous sense of humour enjoying tales of golfing mishaps but also very willing to laugh at himself. Trevor retired from teaching in July 1998 and within 10 days he had been co-opted to act as Club General Manager thus, somewhat to his chagrin, missing out on his six weeks of summer holidays. He performed this task admirably and without salary until the new manager was appointed. Those of you closely involved in Club affairs in the years just before and after the move to Stagsden will know just how challenging those times were. Trevor became Club Captain in 2002. It is often said that each Club Captain has his share of issues to cope with but Trevor and his team were beset with serious financial and staffing issues. He made great sacrifices in the pursuit of the survival of the club and his many other Captain's duties. It seemed that whenever there was a "crisis" Trevor was one of the first to help. As we now know the crises of the early Stagsden years were overcome - just. The debt we all owe to Trevor for his part in achieving this will always be remembered. Later on Trevor became the shining light of the Seniors Section as its secretary. Those of us who worked closely with him came to know that Trevor was not one to let the grass grow under his feet. If anything was overlooked, he would inevitably be on the phone diplomatically giving a nudge in the right direction. The extent to which he modestly and efficiently managed Seniors section affairs and developed its organisation and scope cannot be overstated. The standards and structures he helped implement still remain. If his health had not failed him in recent years he would in all probability still be running the show. He was irrepressibly keen on improving whatever he was involved with organising. He had a fund of knowledge, knew every member, remembered every tradition, but was ever open to new ideas. His involvement in Club affairs and especially in organising the Seniors became a huge part of his life and he loved it. Just as his pupils had been given his unstinting effort so our Club benefited from his 38 years of dedicated service. Sadly Trevor passed away in 2016 but bequeathed us the legacy of his exceptional service and memories of an admirable member. Keith took up membership in 1984. 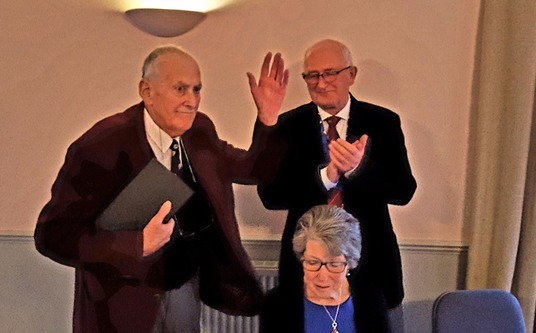 For many years he was a member of the Men's Senior Section Committee and for thirteen years he very successfully managed the organisation of the Senior men's match fixtures. This was a very difficult task, arranging dates and selecting teams for 28 matches every season. His dedicated work over many hours and years resulted in enjoyable hours of friendly competitive golf for hundreds of our senior players. He continued to enter men’s competitions until very recently. During the construction phase of the new courses, clubhouse and driving range he took an enthusiastic interest and made a substantial photographic record of the process which has resulted in the facility we now enjoy. He has also maintained the floral displays around the new clubhouse and in recent times formed a team to plant spring flower displays along the verges of the entrance roads. More recently he arranged men's competition winner's names to be engraved on the Club' trophies. He is also keenly interested in the maintenance of the course machinery, a legacy from his days as a toolmaker/ engineer and he has helped in this very important facet of the greens keeper's work. Now into his 80s Keith continues to show his great interest in all that happens at Bedfordshire Golf Club despite a period of poor health. 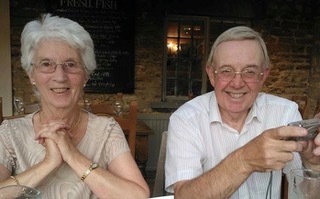 He continues to support the Club with his wife Edna and make a very substantial contribution for the benefit of all members.